Commemorative plates made by upmarket pottery Wedgwood for graduates of an American Ivy League university have been discovered during an event to help homeless youngsters in Cirencester. Experts from Moore Allen & Innocent were running an antiques valuation event at a charity shop that raises funds for Cirencester Housing for Young People – affectionately known as The CHYP Shop – when the plates were brought in for examination. The 15 10.5-inch diameter plates were designed in the 1930s for the Alumni Federation of Columbia University in New York – built in 1754 and considered one of America’s foremost seats of learning – by the famous contemporary architect Francis A Nelson. They were manufactured in Staffordshire by the renowned pottery Wedgwood, but many of the plates never reached their intended destination, as the outbreak of the Second World War led to the cessation of exports. Originally designed as a set of twelve, Cirencester resident Sue Herdman – a former district councillor and one of the five founding members of CHYP back in 1986 – found a pile of 100 of them in a Leicestershire junk shop 45 years ago, and paid half a crown each for 15 of them. Scenes in Mrs Herdman’s collection – which she bought to use at dinner parties – include The Library, The College of Physicians and Surgeons, South Hall, St Paul’s Chapel, College Library, Kent Hall, King’s College, Barnard College, and The School of Mines. 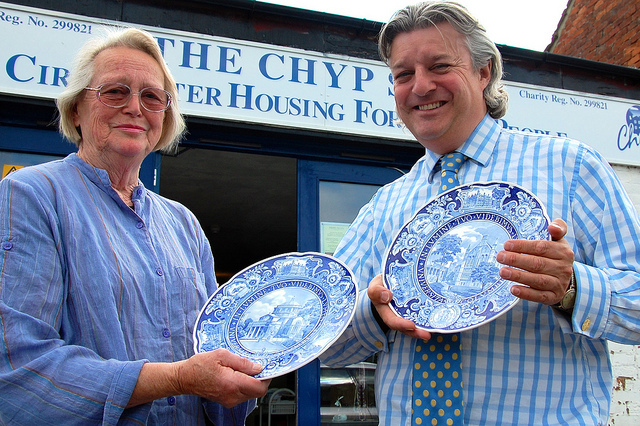 Auctioneer Philip Allwood was impressed with the plates. “They will no doubt appeal to collectors of Americana, and may perhaps even be of interest to the university itself,” said Philip, who estimated the plates should make £200 to £300 at auction. The valuers reported steady trade throughout the day, as members of the public brought heirlooms to be examined and valued in return for a donation to the charity. Among the items brought to the event were a turtle shell mounted on a wooden trophy shield, a Victorian jigsaw puzzle, a gothic revival jewellery box and a 19th century Chinese lamp base. “With cuts in funding from central and local government, it’s more important than ever to support this very worthwhile local charity,” said Philip, whose event raised £260 for CHYP. The charity runs two houses in Cirencester for homeless young people between the ages of 16 and 25. It hopes to raise £40,000 to create extra space at one of its properties with a series of events running throughout CHYP Awareness Week (June 24 to 29).